Undercover Boss on CBS always enlightens the boss. Undercover Boss is a CBS TV show. The storyline is always the same. A senior executive (CEO, COO, etc.) goes undercover inside their own company with a disguise. For a week they pretend to be contestants in a reality TV show where they’re competing for a job. Each day they do a different job in the company. For example, last week the CEO of The Larry H. Miller Group Of Companies, owners of the Utah Jazz NBA team, Greg Miller (his dad was Larry H.) went undercover. He helped put down the basketball flooring in the arena, he worked the concession stands, he worked as part of the half-time dunk team and he also worked in the crowd with the folks who help give fans in the upper deck a great fan experience. That’s the sort of thing that happens in each episode. Along the way, the boss interacts up close and personal with whoever is training him and showing him the ropes. These workers share their insights about the work, the company and their own personal lives. The bosses all quickly discover that by being in the trenches they see things that need improvement. They also find employees who are battling adversity at work and at home. It’s part human interest story, part business lesson and part entertainment. 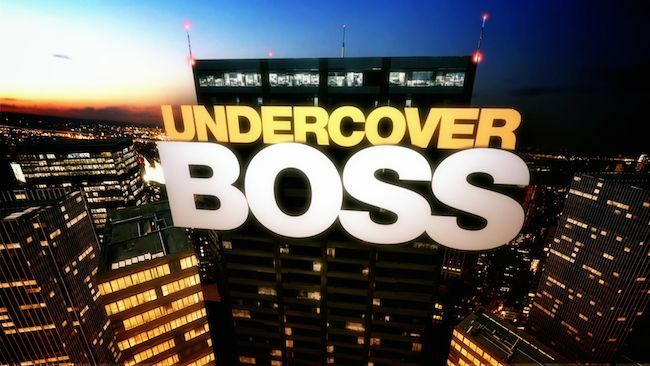 In the end, the undercover boss reveals his true identity and rewards the employees with recognition and some personal help (last week, Greg Miller paid off some medical bills, a car loan and gave some money to employees for college funds). I find every episode heart warming as you hear the stories of courage, commitment and dedication – and as you see the boss connect with front line people in a very meaningful way! Do you have to put on a disguise and fool your employees in order to become a better boss? Maybe it helps get some firsthand stories and information, but there are other things every boss can do to learn the same things we see the Undercover Boss learn. 1. Become a student, not a teacher. The first thing you see every Undercover Boss do is take on a job they don’t know how to do. They introduce themselves (as their alias) to an employee, usually a relatively low level person doing the actual job, not a supervisor. The employee shows them the work, teaches them, then lets them give it a try. Almost always the boss stumbles. Sometimes they stumble badly. As a boss, can you devote yourself to being a student of lower level employees? Can you commit yourself to “stay in character” as a student? Well, the more you can do that…and the longer you can sustain it without thinking you’re too good for this, the better. You’ll quickly learn to appreciate the work and the worker! Additionally, you’ll be in a position to serve better because you’ll be armed with better information to remove the constraints that may be hindering improved performance. That’s the beauty of the boss doing this tough work – the boss has the authority to affect real change! Lower yourself. Be willing to go to the factory floor, the sales floor, the accounting clerk’s cubicle, or any other place where the work is happening. No job is too low. Or too high (obviously). Become the student and behave like a student. Lose yourself in the moment and stay there for as long as it takes to learn all you can. 2. Get personal by being personable. In the course of being vulnerable enough to become a student, the Undercover Boss always finds out more about the person teaching them. If not during the work, then on a break, the boss will ask about the employee’s family. It’s during these conversations that the human element of the work comes to the forefront. Employees often talk of family medical woes, children who need special attention, a recent death or some other challenge that burdens them away from work. Naturally, the employee, not knowing it’s the big cheese sitting across from them, will ask the Undercover Boss about their family, too. It’s what we all do if we have an ounce of empathy, we reciprocate. These are often the conversations that hit the boss the hardest. Hearing these stories of hardship seem to always make the boss realize how exceptional many employees are because they’re often very good as masking their problems. For example, a young lady at the Utah Jazz basketball games is all smiles and bubbly with fans during the game. Privately, the Undercover Boss finds out her heart is heavy because her mom is under tremendous financial strain as the result of unpaid medical bills. Had the boss not asked about her personal life, he couldn’t have possibly known because she was so good at her job of making sure fans had a great time! As you’re being taught, be interested in the person teaching you. Engage them just the way any peer would. Ask about their family. Get to really know them. Avoid making it a one-way street. Be vulnerable by sharing your story with them. I don’t mean your corporate accolades, but your family struggles. Don’t make it a one-upsmanship contest, but make them feel like they know you better in the same way you’re trying to get to know them better. 3. Thank and recognize employees for their work. The Undercover Boss eventually reveals himself to the employees one at a time. Right away, the boss compliments the employee with personal recognition. “I was so impressed with how you went about doing your job of making sure the fans were having a great time. Your energy and personality are a true gift to our fans and I appreciate your work very much.” Any employee’s heart would soar if a boss told them that. So why don’t more bosses do that? Because they don’t understand leadership. Because they see themselves as more important than the employees. Because they think it’s soft and may lead to complacency. Because they’re so used to facing problems they’ve forgotten (or never learned) how to celebrate wins. Because they genuinely don’t care about their employees. Why don’t YOU thank and recognize employees and their work more (and better)? I’m thinking of all the times we’ve seen professional athletes perform well in the face of great adversity. As I record this episode we’re in the throws of the 2014 Stanley Cup Playoffs in the National Hockey League. The New York Rangers are currently doing battle against the Montreal Canadiens. The Rangers began their playoff run in pretty lackluster fashion until some adversity struck their locker room. Martin St. Louis, a player who just entered their locker room at the trade deadline mere months ago, lost his mom just days before Mother’s Day. Her death was unexpected and naturally his teammates felt badly for him. After spending a brief time with his family, he returned the team because he said it’s what his mom would have wanted. He played in the very next game refusing to leave his teammates. It had a profound impact on the locker room. His teammates pulled together like never before. The team went on a winning spree and advanced to the next round. During the break between rounds, his mother’s funeral was attended by the entire team and coaching staff. Martin St. Louis played extremely well during all of this. We applaud such valiant effort…when we see it in athletes. But we don’t do that at work. Why not? Mostly because we haven’t a clue what adversity others are facing. And we don’t care. We tell ourselves that it’s none of our business. We convince ourselves that work is work and the work must be done. It’s a mistake that leaders make every single day. Drive your employees hard. Demand high performance. But you’ve got to take the time – make the time – to thank and recognize employees for their work. Let me appeal to your business sensibilities. How much does thanks and recognition cost? NOTHING other than a bit of time. NOTHING other a bit of awareness and effort on your part. The capital investment is NOTHING. Well, it can be nothing. Sure, you can give people awards or rewards. But let’s not get ahead of ourselves. For now, just remain focused on thanking and recognizing. What’s the ROI on thanks and recognition? IMMEASURABLE. Maybe somebody smarter than me can quantify it, but in all my years of leading people and managing processes I’ve never been able to. However, I do know it’s a bit like those MasterCard commercials. It’s priceless. How can you measure the power of feeling good…or having high morale? Athletes talk about being “in the zone.” It can happen with your employees, too. As the boss you can impact helping people find the zone. The most effective way you can do that is by thanking them and recognizing them for the work they do. If you want your sales team to sell more, thank and recognize them. Then sit back and watch them sell more. If you want your accounting staff to process paperwork more efficiently, thank and recognize them. Then stand back and watch them find ways to be more efficient. If you want your engineering staff to solve problems faster, thank them and recognize them. Then sit back and watch them find a faster gear. Every boss I’ve ever worked with knows and understands that you get what you reward, but few of them make that part of their daily work habit. Most bosses are given to the stick and carrot business model except they gravitate toward using the stick and forgetting about the carrot. If employees never get to taste the carrot, but they’re constantly being beaten with the stick…in time they’ll quickly learn the carrot is fictional. Nothing will move them toward higher performance. Eventually, you’ll leave your people beaten to death by the side of the road. And it’s YOUR fault as the boss. Catch people doing good work. Look for it. Search it out. Do that every day. Do it every hour. Make it your business to lead the cheers to celebrate victories by merely thanking people and letting them know how genuinely appreciative you are of their work. Will it take effort? Yes, especially if you’ve never been used to doing it (and that includes far too many bosses). But keep doing it. Make it a trademark of your leadership and you’ll be rewarded more than you ever imagined by people who will run through a wall for you – because we all want to be recognized and feel special. It’s your job as the boss to make employees feel special. Don’t neglect it. 4. Reward good work with a gift. The Undercover Boss will dole out rewards to the employees at the end of each show. It may be a contribution to a father for his children’s college fund. Maybe it’s a paid trip to Disneyland. This past week the owner of the Utah Jazz paid off the car loan of an employee and bought him a second car because he and his wife both worked 2 jobs each, all with one car between them. I’m not saying you’ve got to buy new cars or give away expensive trips, but I am saying you can’t neglect investing rewards in your employees. Yes, that means spending some money. How much? That’s up to you. Don’t be fooled into the stupid idea that because you can’t do it for everybody, then you won’t do it for anybody. Rewards are democratic. Nor are they always systematic or automatic. In fact, the kind of rewards I’m talking about have nothing to do with compensation. So don’t think about commissions or bonuses here because that’s not what I’m talking about. The Undercover Boss doesn’t dole out extra commissions or bonuses. The boss recognizes the work and the employee and gives them a gift. Husbands, do you give your wife a gift on your wedding anniversary? Why do you do that? Moms, do you give your kids a gift on their birthday? Why? Just because another year has passed? That warrants a gift? No, it’s not merely the passing of another year. It’s the fact that this person is important to you. You love them. You want to show them. The gift is an expression (not the only expression) of that love and concern. When you – the boss – give an employee a gift as a reward and recognition for good work you’re letting them know how important they are to you and the organization. The difference between these gifts and those anniversary or birthday gifts is they’re completely random based on the extraordinary work of an employee. On Undercover Boss the employees never expect what the boss does for them. That’s how it should be in your organization. Your gifts of recognition shouldn’t be expected. Employees expect commissions and bonuses, provided they know the rules going in and they’ve met the standard. That’s not the same thing. That’s compensation, not a gift. A gift is surprise that says, “I appreciate all you do.” Don’t ruin it by making it some standard, systematized practice. Keep it random. Keep it fresh and surprising. Be gracious. These are gifts and they can be whatever you want, given however you want. Don’t sweat keeping score. Don’t try to make things equal. If once a year you want to give an employee an all expenses paid trip to Disneyland, do it. Don’t avoid it because you can’t give that to every employee. If six times a year you want to give an employee an Apple iPad or some other cool toy, do it. Remember, make it unexpected and surprising. Make it genuine and show employees that you’re doing it because you know how hard they work, how well they work and that they make a difference in your company! Today is Memorial Day in America. It’s a day when our country celebrates the ultimate sacrifice made by members of the armed forces throughout history. Many people are off work today. Families spend time outside together enjoying a day off – a 3-day weekend. If you’re a boss, do yourself a favor. Take a bit of time to consider all the benefits of becoming a better boss by embracing the strategies of Undercover Boss. Make the lives of your employees memorable by showing them how important they are to your success as a leader, and how meaningful they are to the work of your organization. You want your employees to be better, don’t you? Then why don’t you show them how determined you are to show them how willing you are to be better, too? Have a safe, happy Memorial Day. Then tomorrow, get busy making this week memorable for your employees.